Longleat is an exceptional place. Not only is it one of the greatest Tudor stately homes in Britain, it is also the world's first drive through Safari Park outside Africa, operating since 1966. It has numerous other attractions, including a fantastic labyrinth, made up of some 16,000 yews and a high-tech motion simulator. 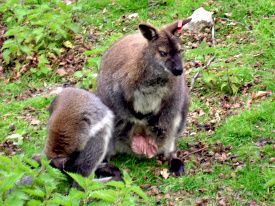 This unique combination of historical, natural and modern entertainment make Longleat compete with Europe's best theme parks. Positioned in the midst of 3,200 hectares of woodland, lakes and farmland, Longleat House is the ancestral home of the Marquesses of Bath. 'House' is of course a typically British understatement, for the whole building is an enormous square erected on 3 storeys, each of the four facades being 12-window wide. Longleat's history starts in the 13th century, when the Black Canons of the Order of St Augustine owned a priory on the site. Financially troubled, the Benedictines sold the priory to the Carthusian monks of Hinton Charterhouse in 1530. In 1541, following Henry VIII dissolution of the monasteries, Sir John Thynne acquired the land for the prodigious sum of £53, at the none less remarkable age of 25. 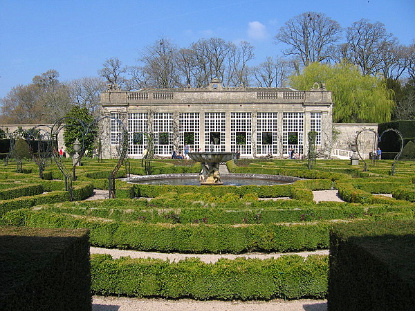 When he died in 1580, the construction of Longleat was not yet completed. The rooms are a marvel of 16th to 19th century furnishings and art. The 11m-high Great Hall is Elizabethan and decorated with wood panels, tapestries and paintings. The Red Library is one of the seven libraries at Longleat, and contains 4,803 of the total 40,000 books of the house, spanning over five centuries of history. The State Dining Room has received such distinguished guests as Queen Elizabeth I (in 1574) and Queen Elizabeth II (in 1980). It was re-decorated by Crace in 1870 and is endowed with many great portraits. The 17th-century Saloon, also known as the Long Gallery, reminds of an Renaissance Italian palazzo, with supplemental Flemish tapestries. The red-and-gold State Drawing Room houses the 4th Marquess of Bath’s collection of Italian paintings. Other notable rooms include the Grand Staircase, remodelled in the 19th century, and the Dress Corridor with its collection of 18th and 19th-century dresses. A full description of the rooms is available on Longleat's official website. The 400 hectares landscaped park surrounding the manor was created by the celebrated landscape gardener Lancelot ‘Capability’ Brown (1715-1783) between 1757 an 1762. Capability Brown also worked at Blenheim Palace, Kew Gardens, Warwick Castle, Bowood House and Milton Abbey, among others. Alexander Thynne, 7th Marquess of Bath, has been occupying Longleat since 1953. In1964, he started painting (mostly in the 1960's) dozens of murals entitled "keyhole glimpse into my psyche", and ranging from philosophical subjects to fantasies and Kama Sutra. Some of the murals can be visualised on the Marquess's private page here. 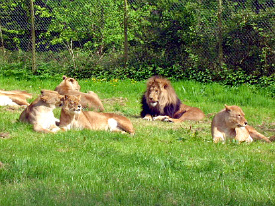 Longleat's Safari Park has been operating for 40 years and is renowned for its wide range of big mammals, and especially the lions that have been here since the park's opening. 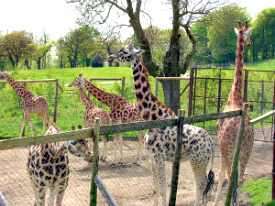 The Safari and adjoining attractions (see below) were the brainchild of the 6th Marquess of Bath, who started the amusement part section on his estate in the 1950's. The safari is divided in 7 areas : the East Africa Reserve, with giraffes, zebras, llamas and camels; the Monkey Jungle, where the primates share their territory with Inidian water buffalos and black bucks; the Big Game Park with rhinos, Bactrian camels (the two-hump variety), oryx and deer; the Deer Park, with the local Fallow deer, which have lived in Longleat since the 16th century, then the Pelican Pond, Tiger Territory, Lion Country and Wolf Wood. 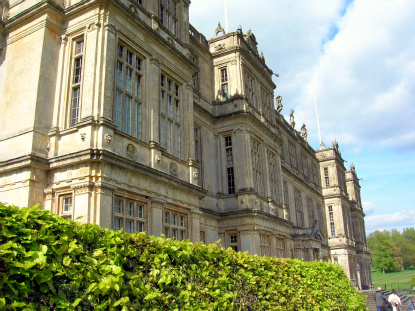 Longleat is surprisingly diverse and has attractions for everyone, from history buffs and animal lovers to children of all ages. In fact, it even has a high-tech Motion Simulator, such as the kind found at Disneyland. In the tradition of British (or at least European) entertainment for kids, Longleat has a huge hedge labyrinth, which total pathway length is no less 2.72 kilometres ! An amazing maze indeed. There is another, much smaller one inside the precincts of the extensive Adventure Castle. Longleat has its own Safari Boats, with Californian sealions swimming in the lake, as well as its own miniature Longleat Railway. There is also a Butterfly Garden, a Pet's Corner (with boas, ferrets, and maned rabbits that really resemble lions) and a bat-filled subterranean adventure experience named Old Joe's Mine. Longleat House is open all year round (except 25 December) from 10am to 5:30pm between Easter and the end of September, and 11am and 3pm the rest of the year. Longleat Safari Park is open from 12 February to the 6 November from 10am to 4pm (until 5pm on weekends and national and school holidays). Other attractions are open during the same period from 11am to 5:30pm. 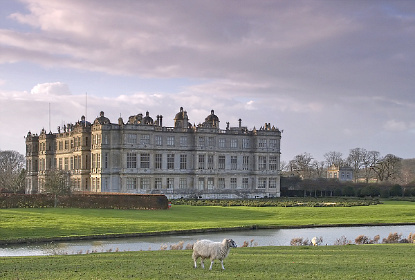 Admission to Longleat House & Grounds is £9 (£6 for children and seniors). Entry to the Safari Park is £10 (£7 for children and seniors). Other attractions cost £2 or £3 each, but the Passport Ticket covers all attractions, including the Safari and House for £18 (£14 for children and seniors). Longleat is on the A362 between Frome and Warminster (about half-way between Salisbury and Bristol). Coming by car from London, take the M3 till Junction 8, then the A303 until you reach the A36 for Warminster. Longleat cannot be accessed by public transport, excepr in summer when the Lion Link bus (operated by Wiltshire & Dorset Buses) shuttles from Warminster station to Longleat's Safari Park at 11:10am and returns at 5:15pm. 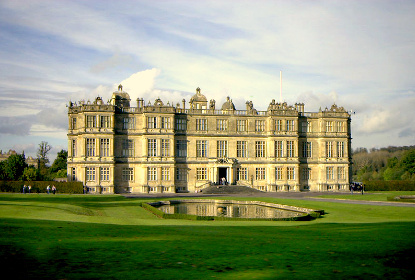 Longleat House is another 4km walk from the Safari through the Longeat Estate.